Maryland Gov. 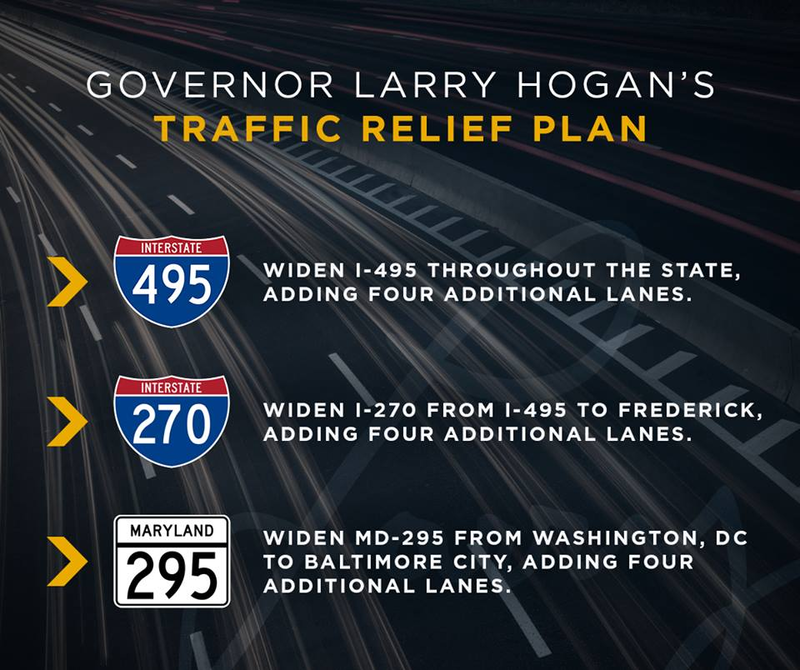 Larry Hogan proposed the largest traffic congestion relief plan in the nation on Thursday, which would widen the entire Capital Beltway (I-495) within Maryland, I-270 and the Baltimore-Washington Parkway (MD-295). The $9 billion plan would add tolled Express Lanes to each road, but not charge for use of existing lanes. To expand capacity on the B-W Parkway, the state would have to be given control of the road by the federal government. Hogan has begun preliminary discussions with U.S. Secretary of the Interior Ryan Zinke regarding this issue, he said. A private partner will be solicited by the state to construct and operate the new Express Lanes on all three highways. Because of the public-private nature of the plan, Hogan can largely move forward on his own to implement it, another plus in what is sure to be a contentious election year legislative session in Annapolis. In a press conference yesterday, Hogan called his plan "unprecedented" and "absolutely transformative." 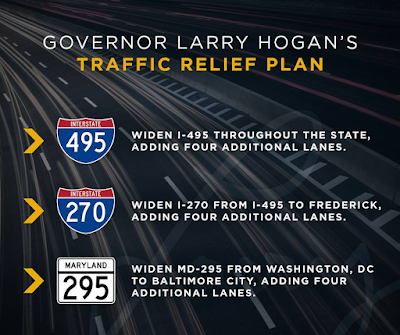 The popular governor predicted that the congestion relief would assist the entire region, not just Maryland residents. Aside from the clear practical benefits, the highway plan is a brilliant political move, as many of Hogan's rivals have already taken the bait and come out opposing traffic congestion relief(!). Other politicians, even those not in Hogan's party, smartly endorsed the plan. Robin Ficker, a Republican candidate for Montgomery County Executive who has called for such a plan for I-270 for years, praised the governor's proposal. "We say thank you to Governor Larry Hogan for putting forth a plan to widen the 495 beltway and I 270," Montgomery County Young Republicans VP Dan McHugh said in a statement. "This will help alleviate the terrible traffic problems we have here in Montgomery County!! This is what happens when you elect Republicans - we get things done!!" Patricia Fenati, a GOP candidate for the House of Delegates in District 14, recalled the many hours she has spent over the years driving from the upcounty into the District for work. "Finally, a hero has come along to look at that problem, and come up with a solution," she said of Hogan. Predictable criticisms and the old "induced demand" canard came from organizations engaged in the War on Cars in our region following yesterday's announcement. "Induced demand" theory has never been proven, as missing pieces of our regional freeway system have been to blame for growing congestion on our few highways. For example, there is no second Potomac River crossing, and no M-83 Midcounty Highway Extended, to relieve traffic on the American Legion Bridge and I-270. And the Capital Beltway was doomed to be jammed when anti-car forces foiled the original plan to run I-95 through Washington, D.C. That dumb move sends East Coast traffic around our Beltway 365 days a year, creating massive traffic jams. What a terrible plan. Spend the money on Metro. Roads are a waste. "Other politicians, even those not in Hogan's party"
Why say this and then only offer quotes from Republicans (i.e., politicians in Hogan's party)? This is plagiarized from Robert Dyer's blog. @September 22, 2017 at 8:52 PM: So you're saying that he plagiarized himself??? You're an idiot. "Anonymous" 12:22 -- Name-calling isn't very nice. Dyer made the rules, not 8:52. Two new lanes on either side of I-270??? There's going to be a lot of eminent domain to make that happen. There are exchanges on 270, where you might have demolish large office buildings to make this happen. The eminent domain costs for miles of widening would be in the billions.